4/12, 11am: Post updated below with a response from Stone. A couple of months ago, to great fanfare and self-promotion, Stone Brewing announced that it was suing MillerCoors over the latter's use of the word 'Stone to promote Keystone Light beer. 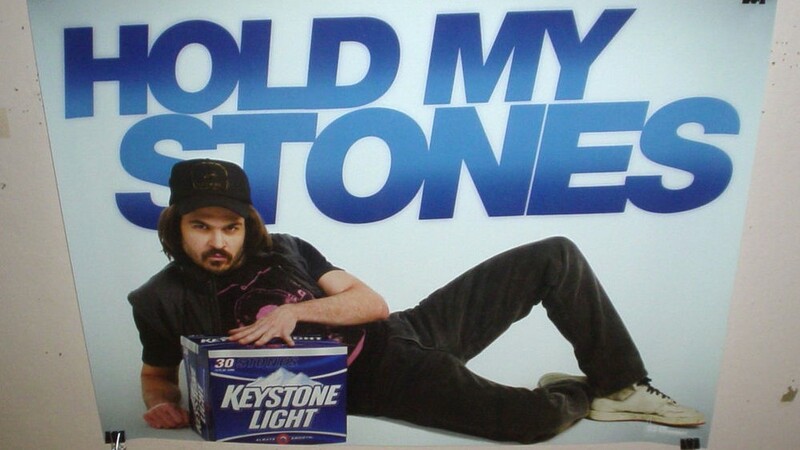 At the time, Stone seemed to have a pretty good case; Keystone did really use "Stone" (or 'Stones) pretty heavily in advertising. Well, today MillerCoors responded, and Stone's case no longer looks so mighty. Brendan Palfreyman, the trademark attorney specializing in the beer industry, has a great Twitter thread you should read if you want the detailed blow-by-blow. Alan McLeod, also an attorney, adds quite a bit as well and it's worth looking at his recent tweets. Now, I am no lawyer nor do I play one on the blog, so you're probably smart to look elsewhere for real legal analysis. However, I will briefly summarize some of the highlights in MillerCoors' 82-page document (distilled from Palfreyman's summary). First of all, there is some really first-rate trolling in the document, matching the trolling in Stone's llawsuit blow-for-blow. I give MillerCoors the edge here, because theirs is more amusing. For example, to Stone's weird inclusion of marketing copy-as-legal-argument in their suit ("like all Gargoyles, it is slow to anger and seeks a respectful, live-and-let-live relationship with colleagues..."), MC responds: "Quite the opposite, Stone Brewing is well-known in the beer industry for its bombastic hyperbole, launching public insults at brewers large and small." They also play a clever turnaround argument on Stone's Greg Koch, who tweeted, a month after filing the lawsuit, "To the folks insisting that people have been shortening "Keystone" to "Stones" for years: WE DON'T CARE what people call that beer." To which MC responded: "Stone Brewing's Greg Koch has even acknowledged on Twitter that Keystone customers have long referred to Keystone as 'STONES." Whoops. Finally MillerCoors also makes this argument, which is sure to set hair on fire in Escondido: "Prior to Stone Brewing's founding, Coors created the iconic craft beer Blue Moon in 1995. Blue Moon is wildly more popular than any of Stone Brewing's beers." Two years later, they ran a "Stone-handed games" promotion which included copy like "salute summer with a 'Stone." Things get worse for Stone from there. MillerCoors also argues that their first use of 'Stones to advertise Keystone dated back to 1995--a year before Stone even existed. That year they had a 30-pack container labeled "30 'Stones." The next year, they had an ad campaign with the copy "Start your party with the 'Stone." They write, "Therefore, Coors' use of STONE and STONES predates Stone Brewing's use of STONE." (At that time, Coors and Miller were still separate companies.) In a bit of trolling, they add, "If anything, it is much more likely that Stone brewing copied the STONE name from Coors, since Keystone beer was already advertised as such in the market." Actually, no, that's insanely unlikely, but lulz for the jibe. Finally, because of this history of use, MillerCoors actually demands a ruling that it get exclusive right to the word, not Stone Brewing: "MillerCoors is entitled to a judicial declaration of its exclusive common law right to use STONE in connection with the sale of beer in the United States." I have no idea what to make of that last demand, but there's a lot of new and pretty damning information in this response. It looks like Coors/MillerCoors has been using some version of the word "stone" since before Stone Brewing existed, and that Stone Brewing has known about it for at least eight years without taking action. All of which makes their current claims of infringement seem a whole lot weaker. At least to this layman's eyes.